In light of recent events, such as the rise of the Islamic State and the oil price drop, the Ukraine crisis got somewhat forgotten and swept under the rug. Nevertheless, although mass media is not talking nor writing about it as much as they did before, it is still a highly significant subject which needs to be taken care of extremely carefully. It seems like leaders of the two most powerful European countries, Germany and France, are ready to hold a meeting with heads of two warring powers – Ukraine and Russia. Merkel, Hollande, Poroshenko and Putin held a joint telephone call this morning, according to the German government. Steffen Seibert, Germany’s government spokesperson, stated that, in that phone call, „they worked further on a package of measures in the context of their efforts on a comprehensive settlement of the conflict in eastern Ukraine“. He added that the German government hopes that the meeting will occur on Wednesday in Minsk. Putin and Poroshenko confirmed that the chances of holding a meeting are high as well, with Putin saying that the meeting will be held „if by then we manage to agree our positions“, and Poroshenko hoping that the meeting will lead to “a swift and unconditional” ceasefire on both sides. 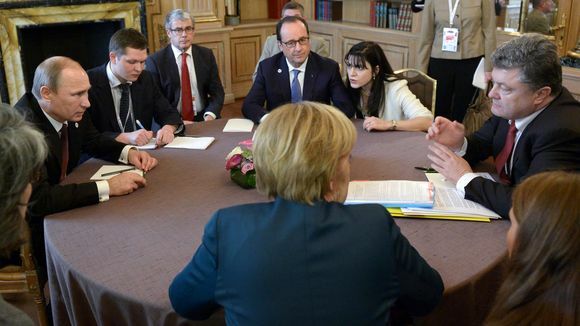 Merkel and Hollande visited Moscow recently and tried to negotiate the peace plan with Vladimir Putin. However, political analysts believe the dispute inside the US on whether to arm Ukraine could actually trigger the Franco-German peace initiative, because Europe is reluctant to have a full-blown war on its doorstep. Hollande stressed the importance of this meeting by saying that this talks could be “one of the last chances” for peace in Ukraine, while Merkel said no to the option of arming Ukrainian army as a possible solution to the crisis. These talks are of extreme importance for European safety, as well as the safety of the world. Therefore, Putin, as an agressor, needs to step down, while Merkel and Hollande need to take a firm guard showing their support towards Poroshenko as a Ukrainian sovereign leader, and towards Putin showing him that the agression on other nation’s territory will not be tolerated.